Twitter has been mostly about tweets. Users have loved this social networking platform because it makes everyone convey their messages with the least use of characters (something which needs time and lots of thought to put in). Twitter has never been much about chatting with your friends, it has always been about sharing your opinion, replying to statements being made by various celebs or politicians over the platform and to be honest it has been the best platform to discover newest piece of information about a certain subject. 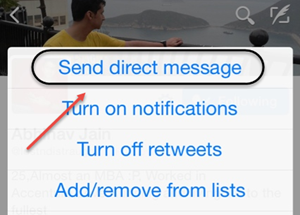 Direct Message is a very old feature introduced by Twitter but it has always involved one to one communication. In other words, you could chat with anyone on twitter as a personal chat. However recently a new feature has been introduced in the twitter application which can help you to have a group Direct Message. Go to the profile page of the person who needs to be the part of that group chat and then tap the highlighted section in the screenshot. 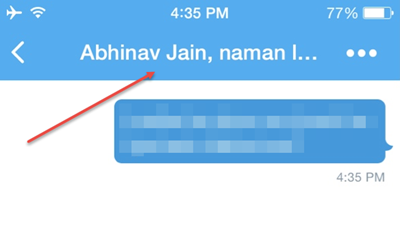 Now you can see that Direct Message window will open for that person. Tap here (in the snapshot) for more options and then choose the option of ‘Add people’. That’s It!! 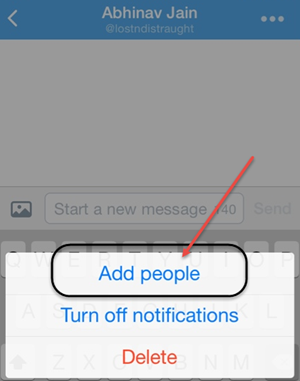 You will be able to add more people to the chat and hence it will becomes the group chat. Twitter has never been about chat but it seems that group messaging is somewhat a hygiene factor which every social networking platform may need in order to get in touch with their friends. Let us see that how does this improvement help in increasing the user engagement on Twitter. 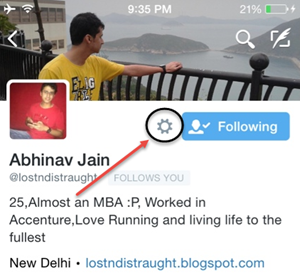 Let us know your opinion about this feature and stay tuned to know more features like these.